PKU Law school carries forward the spirit of openness, insists on the idea of ‘Based in China with global visions’. Therefore we have built a long-term cooperative relation with many famous law schools oversea and set up diversified international exchange programmes together. PKU Law school has built nice cooperative relations with over 60 internationally renowned universities and set up exchange programs with them, such as Harvard, Yale, Stanford, Columbia, UC Berkeley, Duke, U Chicago, Cornell, Oxford, LSE, FU Berlin, Humboldt, UBC, Tokyo, Kyushu, Niigata, Seoul, Sungkyunkwan and NUS. Students of law school can apply for studying in these universities during their college years, and their school record and credit are acknowledged by us. Every year our law school selects nearly 100 students to participate in international exchange programmes, and has set up special fund to give them aid financially when study abroad. Moreover, we encourage diversified international communication, such as large international meeting or academicactivity, speech of noted foreign scholar, judge, publicofficial and lawyer, foreign law course given by visiting scholar, accepting overseas students from Europe, America, Asia and Africa etc. PKU Law School provides international atmosphere and environment, through this way, students here can communicate with foreign scholars and students directly, which help them improve their skill and confidence of international cooperation. 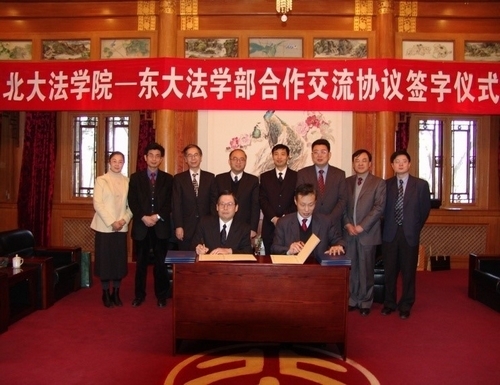 In 2012 Philip C. Jessup International Law Moot Court Competition, the team from PKU Law School won the champion of China region, ranked the 14th in Preliminary for World Series and was the only team of China region reaching the knockout stages of the 32, which created the best record in the last decade. Four team members all won the title of ‘World Top 100 Oralists’ which is the dream honor of students learning international law in the whole world, and that experience would help them step in world leading firms easily in the future. In recent years, about 20% of undergraduates would like to study abroad after graduation each year, and they were accepted by some leading universities like Harvard, Yale, Stanford, Columbia and Oxford for master's or doctor degree. More than 50% of the students from mainland China accepted by LL.M. program of Harvard, Stanford and Columbia in 2014 have an educationalbackground of PKU Law School.